You just can’t go wrong with this combination. 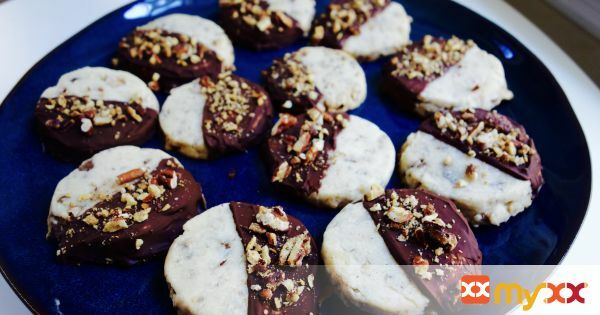 These cookies are perfectly balanced with sweet, buttery, caramel-like, nutty flavors and they’ll leave you wanting more. 1. In a mixing bowl whisk together flour and salt, set aside. 2. In the bowl of an electric stand mixer fitted with the paddle attachment cream together butter and powdered sugar, while stopping to scrape down bowl frequently, until mixture is smooth and creamy. Mix in vanilla extract then with mixer set on low speed slowly add in flour mixture and mix until nearly combined. Add in toffee bits and pecans and mix until combined. 3. Divide dough into 2 equal portions. Shape each portion into an even 6 1/2-inch log on a lightly floured surface compressing dough rather tightly together so there aren't holes in the center of the log and cookies hold together well when sliced. Wrap each portion in a separate sheet of plastic wrap. Chill dough 1 hour. Preheat oven to 350 degrees during last 15 minutes of chilling dough. 4. Remove one log of dough from refrigerator. Cut into slices slightly under 1/2-inch thick. Transfer to a baking sheet lined with parchment paper spacing them 2-inches apart. Bake in preheated oven until just barely golden brown on edges, about 12 - 16 minutes. Let cookies cool 5 minutes on baking sheet then transfer to a wire rack to cool completely. Repeat process with remaining chilled dough, adding the sliced dough to a cool baking sheet. 5. For the chocolate coating: Line two baking sheets with parchment paper. Add chocolate to a medium microwave safe bowl. Heat in microwave in 20 second intervals on 50% power stirring between intervals until melted and smooth. Dip half of each cookie into chocolate, shake to let excess run off. Transfer to parchment paper. Sprinkle each cookie with a little bit of toffee bits and pecans. Let chocolate set at room temperature or in refrigerator to set quicker. Store in an airtight container at room temperature.